August 2, 2017 Michal B.
Prague, the capital of the Czech Republic, is rich in a variety of sights, especially historical ones. But there are also a great number of modern places of interest. One of them is the Prague Dancing House, a highly original building resembling and also inspired by two dancers – the immortally famous duo of Fred Astaire and Ginger Rogers. The Nationale Nederlanden building, known as the “Dancing House” or sometimes “Fred and Ginger”, is one of the most significant landmarks in Prague and definitely the most internationally renowned piece of post-1989 Czech architecture. It is home to almost 3000 square meters of office premises, a restaurant, a gallery, and a conference centre. Most importantly, there is a sightseeing terrace on top of it, from which you can overlook the breathtaking panorama of Prague. The story of the Dancing house reaches back to the end of World War II, when the previous building standing on the site was destroyed during the bombing of Prague by the Allies. During the Communist era (1948 – 1989), nothing was built there, and it was only after the “Velvet revolution” when Václav Havel came with a vision. The world renowned Czech dissident, writer, philosopher, and later the last president of Czechoslovakia and first president of the Czech Republic (after the Czech Republic and the Slovakian Republic split in 1993) wished the site to be used for building up a new centre of cultural and social life. It would symbolise the arrival of democracy to Bohemia after 1989, an exciting era full of hope. Havel contacted his neighbor from the house next door, a renowned Yugoslav-born architect called Vlado Milunić. His design already involved the idea of leaning the building out over the crossroads. However, later on (in 1992) the piece of land was bought by the Nationale-Nederlanden insurance company, which resulted in a rather significant change in direction. The Dutch company’s representative preferred having a modern local headquarters over a cultural centre. But at the same time, it turned out that – as chance would have it – one of the leading representatives of the bank was a friend of Vlado Milunić and liked his project. All the above mentioned factors, together with the company’s wish to have an internationally renowned architect working on the building’s design, resulted in a compromise. Frank Gehry, a famous Canadian-born American postmodernist architect, was invited to co-operate with Milunić. Together they created a design combining the original idea with a new outlook. They created the “Dancing House”, as we see it at the Rašín Embankment today. The cornerstone was laid in 1994 and the operation of the building began two years later. The unusually shaped building, an example of the deconstructivist architectural style, is based on a reinforced concrete construction with 99 differently shaped adjoined facade panels. The frontispiece consists of two towers, resembling a dancing couple. On the top of the Dancing House, there is a dome, called “Medusa” for its shape. The building has 9 floors and the rooms in it are asymmetrical. The house reaches over the street line onto the pavement. Nowadays, the Dancing House is considered one of the most valuable postmodern buildings in Prague and an important part of the Czech capital’s architecture, but there were times when it sparked a lot of controversy. 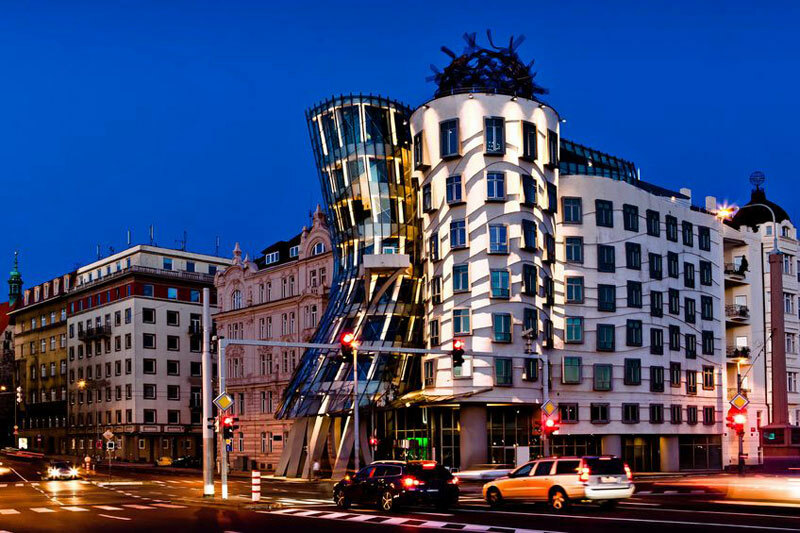 The opponents of the building were convinced that the Dancing House would not fit into its surroundings, since most of the buildings in its neighbourhood are in the Art Noveau style. There was also a great dispute about the highly unusual shape of the building, with the impression of the towers leaning. However, the Dancing House proved itself to be a true architectural gem of Prague, and today you would be hard pressed to find anyone who doesn’t like or at least accept it. 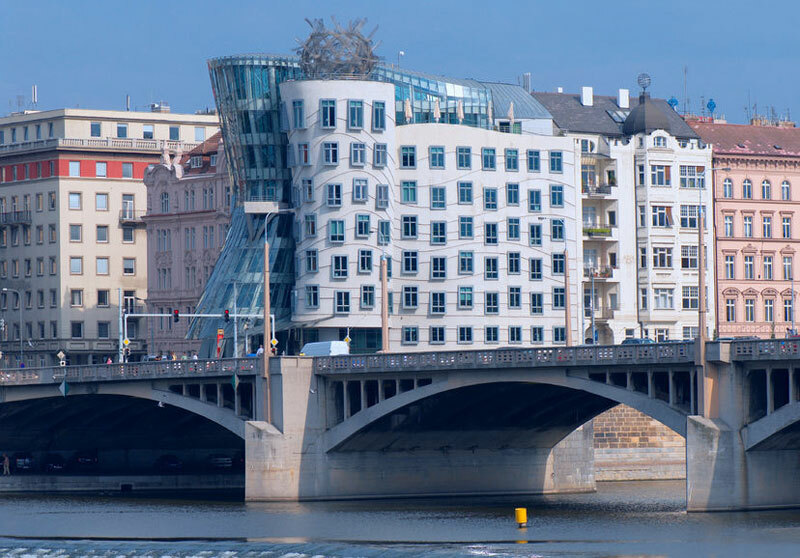 You should definitely visit the Dancing House for the fact, among other things, that this unmistakable gem of Prague’s postmodern architecture also offers a rare view of the Vltava River and Prague Castle. Full address is Jiraskovo namesti 1981/6, 12000 Prague 2. You can get there by tram; the “Jiraskovo namesti” station is right next to the building. If you prefer the metro, you can walk just a bit from the “Karlovo namesti” station. There is of course no entrance fee to the building itself, and the building is open daily from 10 a.m. to 10 p.m. The terrace with its amazing view is accessible via the Glass Bar. Gallery is open every day from 10 a.m. to 8 p.m. and the entrance fee is 190 CZK. Restaurant is open everyday from 11 a.m. to midnight. Glass Bar is open everyday from 10 a.m. to midnight. As mentioned above, the Dancing House primarily contains offices, but you don’t need to rent an office space to go inside. On the uppermost floor of the house, there is a restaurant called – what else – “Ginger & Fred”. The modern-looking, high cuisine restaurant with artistic elements offers French and international dishes and offers an amazing view of Prague’s panorama. The restaurant is open every day from 11:30 till midnight, and the kitchen operates till 23:00. To see the menu, pictures, and more info on the restaurant, visit its web page. Yet another public space of the Dancing House is the Dancing House Gallery. Located on the ground floor, the Gallery focuses mainly on the top of the contemporary world and Czech art. It also supports young talent and, as the representatives declare, “The Dancing House Gallery seeks to connect the everyday world of people with the world of art through guided tours, lectures, discussions and other professional activities and by raising awareness about contemporary art and the art market to the general public”. 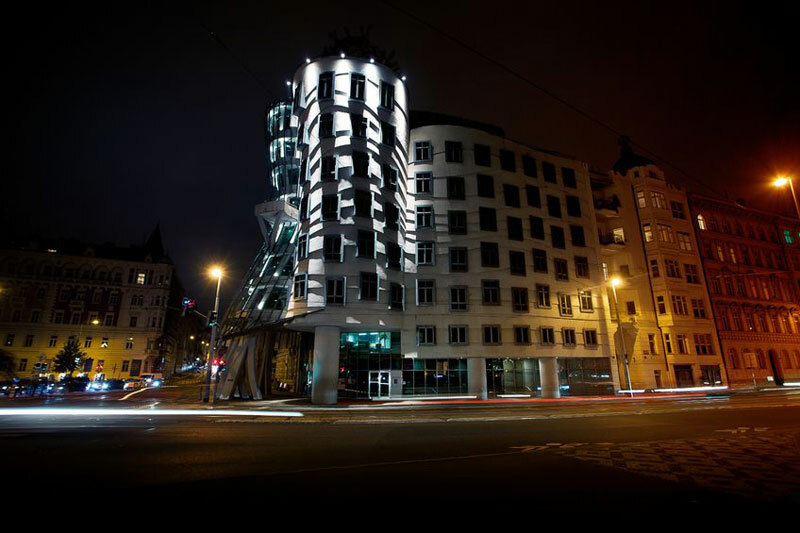 The entrance fees to the Dancing House Gallery differ based on the particular exhibitions. For info on the actual exhibitions, visit the gallery´s web pages. The gallery is open daily from 10 a.m. to 8 p.m.